Mandy and Capt. 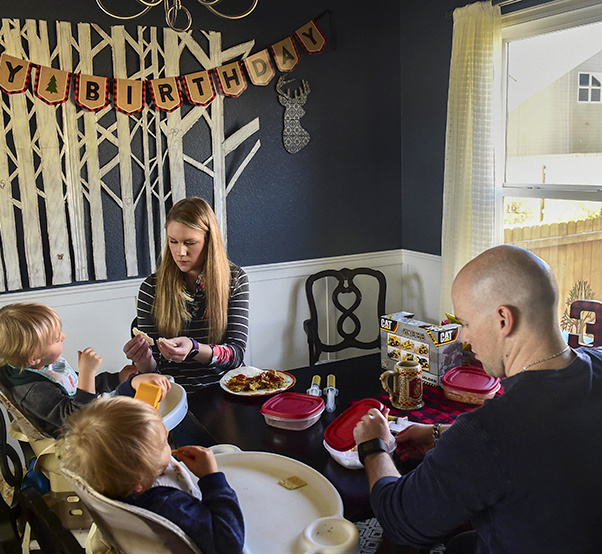 Matthew Douglas feed their children Nov. 3, 2016, in Colorado Springs, Colo. 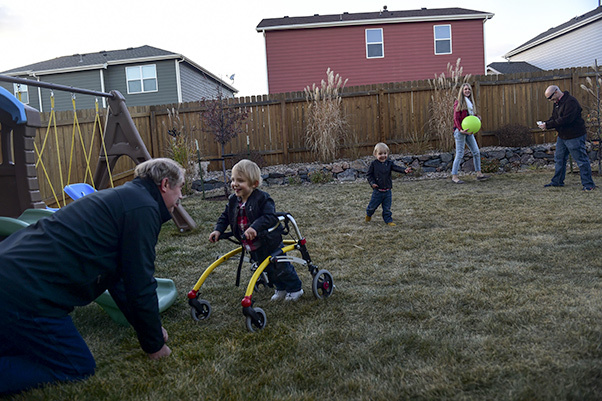 The twins, born premature at 23 weeks, celebrated their third birthday with family Nov. 2. Being able to feed the children together is a rarity due to Matthew’s position as a logistical and support officer for Air Force Space Command. “It was the worst day of my life,” said Capt. Matthew Douglas, the Air Force Space Command logistical and support officer. When Matthew and his wife, Mandy, were pregnant with their twin boys, Dean and Luke, she began to feel contractions at 23 weeks, which is significantly shorter than the average 40-week pregnancy. Mandy knew that was the day she would finally meet her sons, but nothing could prepare her for the journey ahead. Mandy’s pregnancy was cut short without any notice, leaving her to wonder what a full-term pregnancy experience would be like. Matthew and Mandy welcomed two little boys into the world Nov. 2, 2013. With Dean and Luke being born much earlier than planned and underdeveloped, many medical issues affected them, including chronic lung disease, multiple heart surgeries, gastrostomy tubes for feeding and Dean having numerous brain bleeds and ocular nerve atrophy, a rare form of blindness. Although they are twins, the boys have dealt with different issues. Dean has had aspiration pneumonia once before, he had to undergo surgery to stretch his esophagus, and an original Nissen fundoplication surgery to reduce the chance of acid reflux and vomiting, which had to be redone, that resulted in many more complications. Luke also had a Nissen fundoplication that has partially failed, however, due to the life-threatening complications Dean experienced, the Douglas’ are not willing to have it repaired. Luke did not suffer from brain bleeds, so his vision has not been affected and he is physically capable of running around like a normal toddler. The Douglas family spends an afternoon outside playing Nov. 2, 2016, in the backyard of their family home in Colorado Springs, Colo. The twins enjoy playing outside; however, if they are too active there is a chance of them vomiting due to their vocal chords not functioning properly, stemming from premature birth complications. It took time for Matthew and Mandy to figure out the line between parents and caretakers, especially for Mandy, since she stays home with the boys on a daily basis. 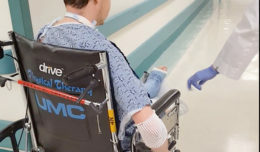 Even through all of the medical issues, nurses, surgeries and internal family struggles, Matthew and Mandy both agreed that they would not be in the position they are now if it were not for the Air Force. The Air Force has provided the Douglas family with medical care, the opportunity for Matthew to spend as much time as possible with his family, especially when the boys needed extra medical attention, and a support system that is the Air Force family. Raising twin boys is hard enough, but having to maneuver around medical personnel while making decisions on how to handle the boys made life much more complicated for the Douglas parents. Another emotional challenge the Douglas’ said they experience is finding alone time. It is difficult for Matthew and Mandy due to their children needing more care and attention, and the lack of trained and capable people able to take care of them makes it even harder. “Nobody else besides us and certified nurses can take care of our boys,” Matthew said. However, the struggle of raising twin boys with numerous medical issues has brought the Douglas’ family closer and allowed them to grow as a unit, as well as individuals. The Douglas’ have fought through over three years of medical challenges, learning about being first-time parents and much more. They continue to work to provide Dean and Luke with the best life they can. Their situation changes every day and they work harder as each day passes to make life work and help the boys grow. 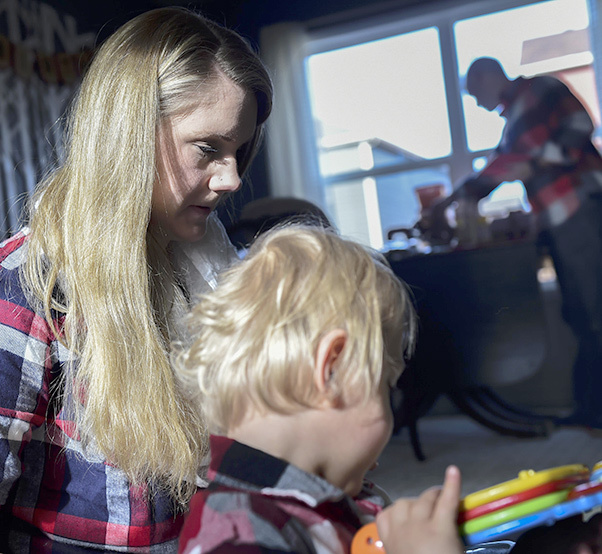 Mandy Douglas plays with her son, Dean, Nov. 2, 2016, at their family home in Colorado Springs, Colo. While her husband works at Peterson Air Force Base, Colo. Mandy stays at home with their 3-year-old twin boys to take them to doctor’s appointments, take care of their daily routines and maintain the house. Dean and Luke were both born premature at 23 weeks. “I know they will become strong, independent, intelligent, mobile, gifted young men,” Mandy said. 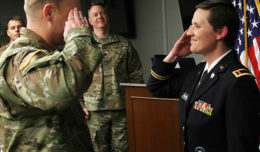 With the help of the Air Force, Matthew and Mandy said they have learned how to navigate the struggles of being parents to Dean and Luke, while also maintaining a strong marriage with each other.